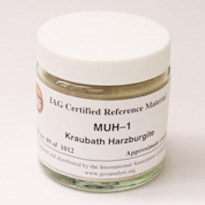 “Montauniversität Harzburgite” MUH-1 is an ultramafic rock powder reference material certified for major and trace element mass fractions. This material is typical of a partially serpentinized harzburgite. The source material for MUH-1 was derived from the “Hartsteinwerke Preg” quarry near Kraubath, Styria, Austria (Latitude: 47°17’2″N, Longitude: 14°56’53″E). This quarry is the largest of its kind that accesses the massive mantle section of the Spike Complex. 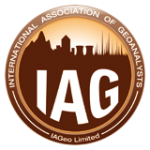 The main part of this complex is composed of highly depleted serpentinites with typical harzburgitic compositions. Approximately 150 kg of crushed material from the “Hartsteinwerke Preg” quarry were shipped to Ontario Geoscience Laboratories for grinding, homogenizing and bottling of the material. The material was ground to 90% ≤63 µm (230-mesh) in a continuous-feed Cr-steel ring mill and blended for 24 hours in a large-capacity blender. Approximately 80 kg of the pulverized material was subsequently transferred into 100 g jars for distribution.